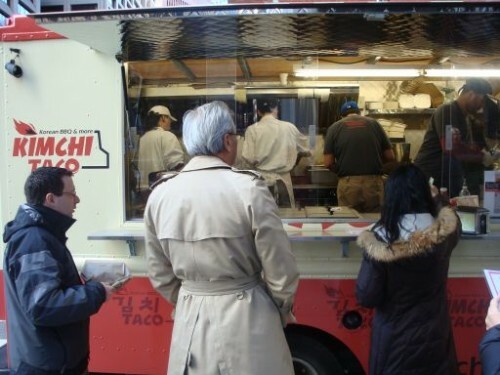 The Korean taco truck explosion that started with Korilla BBQ Truck and continued with Big D’s Grub Truck now includes Kimchi Taco Truck, which made its Manhattan debut in the FiDi yesterday despite getting hopes up in midtown last week. 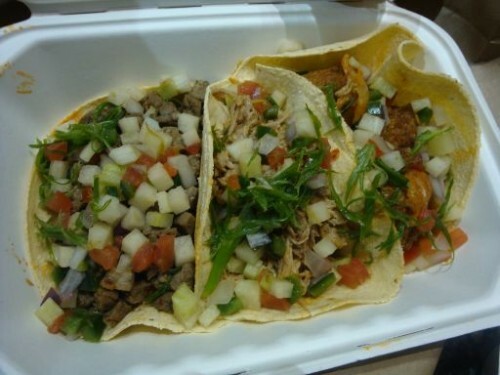 I wanted to see how their goods compared with Big D’s since they have some similar taco fillings and the price for three tacos is $7 at both trucks. 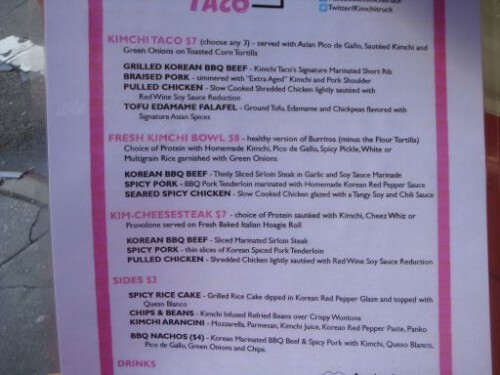 Kimchi also has some interesting sides like kimchi arancini and Korean BBQ nachos. Tacos and fried rice balls? Sold! The truck parked in Long Island City last week to get its sea legs and then wisely progressed to the FiDi instead of facing the masses in midtown. I say this selfishly, of course, because that meant I got to try the food. When I got there not long after they opened there was a line but I was impressed by their efficiency in getting food out. They’re the first truck I’ve seen that has a computer system for ordering. I was kind of torn between the Kim-cheesesteak or tacos. They also have a meat over rice option. In the end I decided the tacos were the way to go and ordered one each of beef, pork and tofu edamame falafel (they also have pulled chicken). Yeah, you read that right: They sell some sort of Middle Eastern/Asian/Mexican mashup that is falafel in a corn tortilla with kimchi. How could I not order this? To top it off I went for an order of the arancini ($3) that also sounded like an Italian/Korean gamble I wanted to take. My order was up soon enough and I headed off to again stink up the immediate vicinity with my Korean taco truck lunch. At least this time it didn’t smell like a low-grade stink bomb went off when I took the containers out of the bag. I opened the arancini first and would have to say it was kind of a waste to put three rice balls in a container this size. And paying $1 apiece for fried and cheese balls seems a little steep, but I’d have to say they were one of the best parts of my lunch. They had some bite to them thanks to the additions of Korean red pepper paste and kimchi juice, but dipping them in the hot sauce I was given took them to another level. The tacos were a little hit or miss, but since the truck is fairly new I’ll go easy. I was sad to see they didn’t double up on the tortillas and that there was too much meat in two of them. When I picked up the beef one (on the far left) half of the filling fell out and the toasted rather than steamed tortilla didn’t hold up very well. This problem was worse when I picked up the pork taco and found the kimchi and meat juices had disintegrated the tortilla while it was sitting the container. It fell apart about halfway through eating it, leaving kimchi all over my hands. 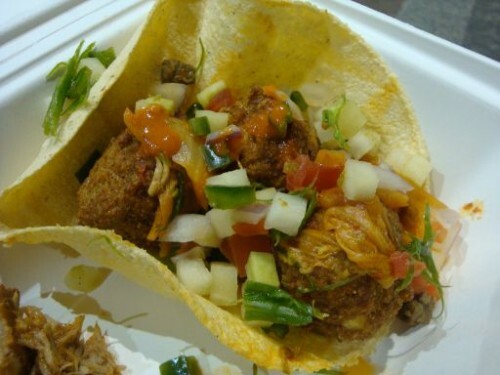 I don’t know if it was the novelty of it, but the falafel taco was my favorite. Both the beef and pork fillings were either a little dry or left the kimchi to provide most of the flavor but the falafel was neither. This truck really knows how to fry balls of things! And because there weren’t a bunch of juices in this one the tortilla didn’t fall apart. I liked the inventive menu items at this truck, and really wanted to try some of the other sides or a bowl but will have save that for another time. In the meantime, I hope they consider either not toasting the tortillas or doubling up so I don’t end up eating half of the fillings out of the bottom of the container with a fork. Posted by Andrea H at 8:30 am, March 8th, 2011 under Kimchi Taco Truck, Korean, Truck. Thanks for the review. I almost didn’t eat my packed lunch yesterday so I could go try them out but I’m too cheap and I thought you might review them. And you did, Yay! I can’t believe you said that there was too much meat! Is there such a thing? I wouldn’t have been annoyed by too much meat…if all of it hadn’t fallen out as soon as I picked the taco up. There was not enough tortilla to contain it! Tried out Kimchi Taco yesterday. Got there at 12:15. There were about 5 people waiting to order and about 8 people waiting to receive their orders. That said, it took about five minutes to receive my food once I ordered. I went for the kim-cheesesteak (beef w/cheese wiz – $7) and a side of kimchi arancinis (rice balls – $3). Sounds like the bread held up better than the tortilla at retaining the substantial amount of meat… The kim-cheesesteak was darn tasty. 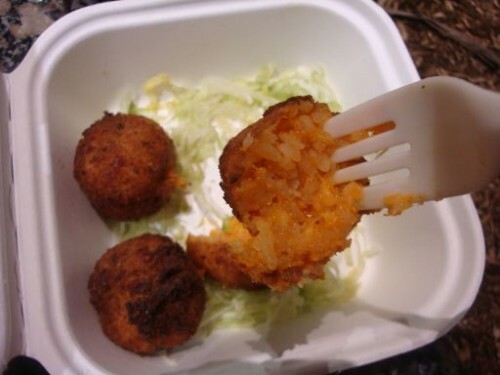 The kimchi rice balls were tasty as well, but a bit expensive at $3 for 3 falafel sized balls. All in all, a welcomed addition to the growing number of korean mashup trucks. Got there at 12:30- waited 15-20 min for my food (not bad considering its their first day in Manhattan). Couldn’t tell the diff between the chicken and the pork. Pork taco tasted like cuban style las carnitas with a piece of kimchi in it. Large portions for sure! But the beef was dry. They were tasty tacos but mostly from the onions + hot sauce I drowned them in. Overall pretty good. I finally tried this place. I had the beef bowl, since they were out of the cheesesteaks. It was ok, but I prefer korilla.